The telecommunication racks offered by us are fabricated from premium quality raw material. They comprise of outer profile and an inner profile delimiting a hollow interior which is used to run connections along equipment supported by said uprights. These telecom racks are provided at competitive price to our clients. We are engaged in offering Telecom Racks to our clients. They are reliable and cost effective. Our racks are manufactured with fine quality raw materials, which help to enhance better functionality of the product. These have a vital demand in the market because these are specifically designed as per the area of application. 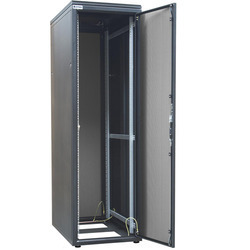 - supreme quality telecom racks are chemical resistant, fire resistant, water resistant and dirt proof. - our array of telecom racks are made with good quality raw material and ensure long service life. - these telecoms racks are robust in construction and easy to install. Racks for Small Network, AV, Telecom & lab application. Racks manufactured out of Formed steel frames & members, individually Powder coated and bolted with highest quality standards under stringent ISO 9001-2008 manufacturing & Quality management system. Standard for Racks configuration will be vertical frame bolted with 2 No. of bottom angle steel / aluminium and top cover. We offer a wide range of Telecom Rack. We bring for our clients Telecom Rack that offer standard 19 inch fixing rail with frame. Our expertise in the specific industry enables us to provide customized options as of panels and doors. Through our wide exposure and relevant experience in industries, we have emerged as prominent manufacturer and supplier of Telecom Rack. This is fabricated using the innovative technology. Our range is offered at market leading price.